New outing added – August 28-30 at Casini Ranch! Information will be posted on the Event page for this outing as soon as it becomes available! Registration now open for Woodson Bridge Outing! Just added – registration for the June 4-7 outing at Woodson Bridge in Corning! You can find the details on here! The registration deadline is May 24th, so make your plans soon! There are currently 3 outings that you can register for now! Here they are! Location: Woodson Bridge RV Park Corning,CA. Lake Pardee registration almost full! This is just in from Jana Kattenhorn, the host of the Lake Pardee outing April 30 – May 3! There are only 2 camping sites with hookups left and 2 pads down below with hook ups available for the Lake Pardee outing. So act now to get your registration in by going to the Lake Pardee registration page now! Registration is now open for Lake Pardee Outing! Plan now and register for the April 30- May 3rd FreeWheelers outing at Lake Pardee! Registration is due no later than April 24th, so you have some time, but why wait??!! You can see all the details about the outing here, along with a link to our handy online registration form for this outing! Have questions? The web page for each of our events has a contact form for the outing host – so use these forms to ask a question about the outing you are interested in! If you have questions about this web site, or FreeWheelers in general, leave a comment here and we will get back to you! Here is another review of a campground that Freewheelers visits every year — the Sugarbarge RV Resort! But the reason I am inspired to post a review of this campground is because it was our “home” for 3 months in 2005! Yes, ten years ago, Karen and I, in our Winnebago Adventurer, lived here from January through March almost ten years ago! We were planning to move to California in the fall of 2005, and decided to escape the Connecticut weather and take up residence on Bethel Island while we explored the Bay Area to decide exactly where we wanted to live. It was a magical time! The folks at Sugarbarge were wonderful! We had everything we needed, and the location was ideal. We learned to use the BART to go in to the Oakland and San Francisco locations we wanted to visit, and we were able to explore the wonderful places around Brentwood, Antioch, Pittsburgh and other surrounding communities. It was a great place to set up “home” for the time we were there. BART, and all the surrounding towns, are within a 30 minute drive of the campground, so not only did we have a peaceful, rural setting for our RV home, but easy access to the rich resources of the entire Bay Area! But it is also a wonderful campground for our Freewheelers group! The clubhouse is ideal for our group gatherings. The restaurant is open seasonally, and when it is open it is a terrific alternative to RV food!! 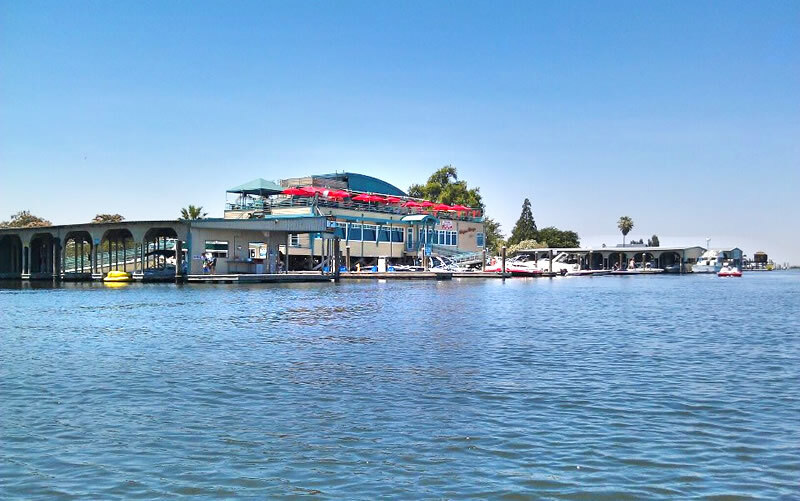 The marina offers lots of options for water activities, and I have taken wonderful walks on the roads around the park. The island is a little rural community unto itself – an wonderful experience if you want to venture out into the community! Do you have a campground that you love? Send me your review and we will get it posted here! Today I am starting a new blog feature for FreeWheelers – a “review” of the campgrounds that FreeWheelers use and know. I will post here a feature on the campgrounds of our immediate past outings where folks can share our comments, hints, feedback and general experience in the campgrounds we visit. You can also send me a suggestion for campgrounds that you want to list on our blog! Eventually this blog will have a rich resource of information about campgrounds in northern California that you can search to find just the right spot for your next trip, or just the right spot for a future FreeWheelers outing! I am starting with Jackson Rancheria! Our chapter has returned to this spot annually over the past several years, so obviously it has become a chapter favorite. It is located on the grounds of the nearby Casino, and has a Good Sam Rating of 10-10-10. Since there seems to be only everything to like about this campground, you may have some hints to share about your experience here! Let us know what you like, perhaps something you find not-so-good about it, and general information so that someone who has not been there has a better idea of what this campground offers (or does not offer! Please leave your comments below — they will serve as an ongoing resource for everyone about this campground — Jackson Rancheria!